We keep a huge range of cylinder head gasket in Payen, Corteco, BGA, Glaser, Victor Reinz, FAI & Ajusa. 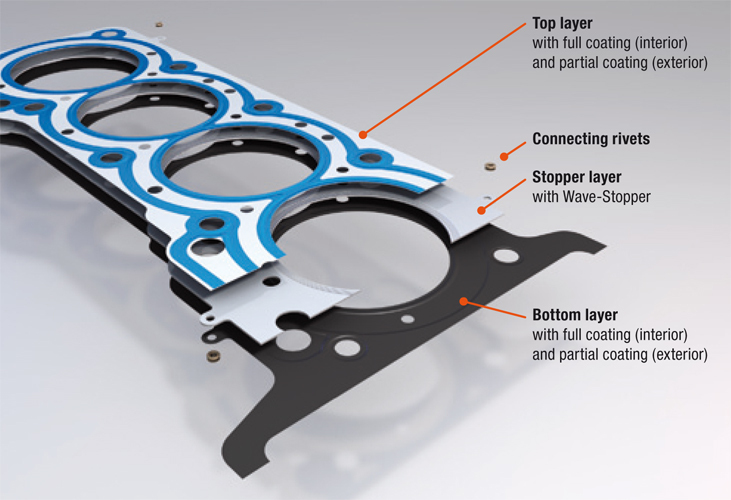 The cylinder head gasket is located between the cylinder head and the cylinder block to perform a gas and water tight seal within the engine. Gaskets can be made from different materials. The most common material used today is a multi layered steel gasket. Single sheet steel gaskets, composite / fibre and copper gasket are also available. Copper gaskets were used years ago on older engine, like Triumph's and the classsic A-Series. These copper gasket included asbestos and are now banned from use. Fibre gaskets are now used to replace gasket where copper was used. Copper gaskets are still available but am alternative is used opposed to asbestos. Head gaskets are crushed when the cylinder head is clamped down with the head bolts to the block. The correct tightening sequence and torques must be used to ensure optimum sealing of the gasket. If the cylinder head bolts are over tightened, it will crush the gasket too much rendering it useless. We recommend that cylinder heads are skimmed by an engine reconditioner prior to assembly. Any imperfections in the cylinder head face may cause the gasket to leak.